Vinyl records are produced in a variety of formats, and have a variety of terms describing them. Most of us kids that grew up with CDs don't know too much about this stuff, so I have prepared this handy guide! It should also be noted that vinyl records have gone through a wide variety of format changes over the years. From their size to their playback speed to the depth of the grooves, and even the way in which the grooves are read, there are tons of formats out there, most of which are obsolete and very hard to find. I only want to focus on the main formats that are being used today, so this guide is not complete by any means. If you really want to get into the history of vinyl, I highly recommend Wikipedia's page about the Gramophone record. With that said, here is the abridged version from Vinyl Revinyl! I have seen these acronyms all over the place in music shops for as long as I can remember. However, to call something an EP or an LP is generally not very accurate way to describe a record. In short, EP stands for "extended play", and is generally used to describe a 7" 45 RPM record. LP stands for "long play", and is often used to describe 12" 33 RPM records. However, these definitions are not completely sufficient because EP and LP are used to describe a variety of other record formats, most of which are out of print and obsolete. In general, all you need to know is that some people use the term EP to describe a single or short record with a few songs. LP is generally used to describe full-length albums. Why is a single 7" record referred to as "Extended Play"? The reason is that this new EP format did allow for extra playing time compared to what was offered at the time. Back in the bad old days, large records (10 and 12") would only play about 3-4 minutes per side. 7" EPs can play up to 12-15 minutes per side, hence the name "extended play". Records are played back at a certain RPM (rotations per minute) on your turntable. However, to be played back at that speed, it must also be recorded on to the record at that speed. Records that rotate at faster speeds generally contain more musical data, and are said to sound better. These days, most records that you'll come across are recorded at 33 or 45 RPMs. 78 RPM records are still out there, but as far as I know, no one is making them. Many newer turntables won't even play them because they don't have a setting for 78 RPMs. Most records that are recorded at 45 RPMs are singles. Many of these records feature a large center hole so they can be used with jukeboxes and record changing mechanisms. To play a 45 on a turntable with a small spindle (the needle in the middle of the platter), you need a plastic "spider" that snaps into the center of the record so it can be played. However, not all 45 RPM records are singles, or "EPs". Some LPs are being released at a playback speed of 45 RPM. Some believe that 45 RPM records sound better than 33 RPM records, and some audiophile-grade records use the faster 45 RPM format. I recently picked up Metallica's Master of Puppets in the 45 RPM format, but don't have a comparable 33 RPM record to compare it to, so I can't comment on improvements in sound over a 33 RPM record. I can say that it sounds WAAAAAY better than a CD. Some old record formats play back at 120 RPM. Record grooves are about 25 microns (.001 inches) wide. Some records are read by the stylus from the center of the record, outward (CDs operate this way too), as opposed to being read from the outside of the record in. Alright! I hope you learned something here. Kick back, and enjoy the music! Nice primer, but I feel, (as the owner of a Thorens TD 124) that you should have mentioned the reason for the 16 RPM speed. It was for voice recordings only. I vaguely remember seeing machines at larger stores, (such as Sears) that you could sit down in a booth and make a record, for example, to send to Grandma. They were also made for blind people, as a way to extend the playing time, so they wouldn’t have to change the record as much. Of course, the downside to this is that the fidelity was only suitable for spoken word recordings. This is, of course, before tape recorders became popular and cheap enough, (can you say cassette)for most people to afford. I also remember cheap “flexi” records, made out of thin plastic, (usually in cereal boxes) that ran at the 16 rpm speed. Thanks for filling me in, Gene! I had no idea that 16 RPM records were used for the purposes you mentioned. Actually, they did make 7-inch 162/3RPM Music records for Chystler’s Highway Hi-Fi system. It never really took off, because of the expensive factor in adding a record player to a car, and the fidelity on 7″ 162/3 records was not as good as a 12″ 331/3RPM LP record, which is WAAAAAAAAAAY better than tinny 45’s and bland CD’s. I totally agree with you Pegasus. 45’s are a little to high on the treble, and cassettes lack the dynamic range. CDs also lack the quality of life. The absence of crackles, pops, clicks, rumble and wow/flutter that most “normal” people thick sounds bad is life of the sound. As far as records go, the lower the RPM, the deeper, richer and fuller the sound. I still think VHS is more lifelike than DVD also. Though commonly referred to as 78’s, ironically, none were designed to be played back at exactly 78 rpm. Even the term “78” is misleading, as the actual rpm later agreed on with the advent of the AC motor, is actually 78.26 rpm. Emil Berliner (the inventor of the gramophone) determined by subjective listening tests, the optimum speed for recording vintage records. The resulting optimum speed is dependent on a balance between the groove width, stylus and design of the cutter & reproducer. Best results were obtained at speeds ranging from a low of 70 to a high of 90 rpm, and Berliner and his British Gramophone Company, determined the best sound was obtained at 78 rpm. Since Berliner & his Gramophone established the record format to begin with, other manufacturers followed Berliner’s lead, & 78 rpm became the defacto standard. Later however, the standard was changed to 78.26 rpm – and is the standard that remains in effect to this day. The reason for the change is actually perfectly logical. The slight change came about with the introduction of the synchronous AC motor. All AC powered turntables in the US run off standard 60 Hz power, and use synchronous motors. A synchronous motor’s speed is locked to the line frequency. This yields a constant rpm, even though line voltage may fluctuate, thus minimizing any power induced fluctuations in the playback speed. Thus a standard 60 cycle synchronous motor will run at 3600 rpm (60 rev/sec = 3600 rpm). The closest integer gear ratio to reduce the 3600 rpm down to about 78 rpm is a ratio of 46:1. Dividing 3600/46 , yields 78.26 rpm. Voila ! – – – – the new standard was set….. The 33 1/3 speed came about with the advent of early sound films. In the early days of film, the audio was recorded on a separate record. 12 inch 78 rpm records using Gramophone groove widths, could hold about 5 minutes per side, yet a reel of film in those days, could run for about 11 minutes. Simply dropping the record recording speed down to 32 rpm would enable the full length film audio to be recorded non-stop on one side. Ultimately, 33 1/3 (3600 divided by a gear reduction ratio of 108:1) was agreed on as the final modern standard. Plus European power at 50 Hz yields a synchronous motor speed of 3000 rpm. – so an even gear reduction of 90:1 also yields 33 1/3. So 33 1/3 rpm was a “magic number” ! The 16 rpm speed came about as a necessity to maximize continuous recording times. 16 rpm was exactly 1/2 that of the 32 rpm used for recording early films. The low speed combined with massive 16 inch diameter disks (transcriptions) could yield up to about 30 minutes/side. Audio fidelity is rather poor due to the slow speed especially towards the hub(300 – 3000 Hz), but is perfectly acceptable for voice quality. Up to this point, standardized speeds were determined by subjective listening, and “fine tuned” for compatibility with synchronous AC motors and gear reduction ratios. The 45 rpm speed was the only speed to be determined by a more precise scientific approach conducted by RCA Victor in 1948. RCA showed that the optimum use of a disc record of constant rotational speed, occurs when the innermost track diameter is half that of the outermost recorded diameter. Given the adopted CBS vinyl groove dimensions (microgroove) and certain assumptions about the bandwidth and tolerable distortion, RCA plugged the numbers into their algorithm & a speed of 45 rpm was shown to be the optimum for this 7″ record size format. You wrote a very informative and comprehensive article. Thank you! EPs are NOT singles. 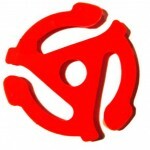 EPs refer to a 7″ 45RPM format with more than two tracks (one per side). A single is just that – a single song per side. You also omit 12″ singles. These are a 12″ 45RPM format and usually have just one song on the A side and typically one or two on the B side. The A side track is an extended version of a 7″ single. In the early ’80s, these were exceptionally popular and some bands released multiple versions of their songs. A classic example is Frankie Goes To Hollywood (‘Relax’ and ‘Two Tribes’). Generally, they were pressed with a heavy weight vinyl and sounded much better than the 7″ version. Sometimes, though, they were released as picture discs (as were albums) which sounded horrible.